Welcome to a new little series here on of life and style! If you don't know I'm working as a summer intern which you can read all about here. It's my first ever internship so I thought it'd be fun to share my experience on the blog! 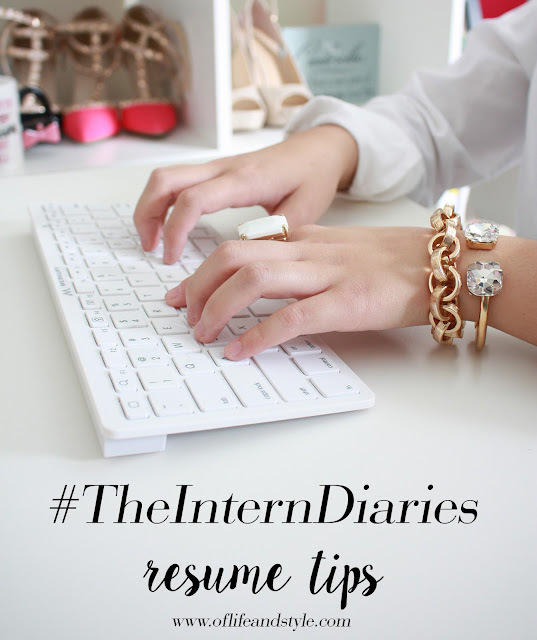 So I'm starting this series, #TheInternDiaries, which will be posts focused around being and intern. I'll post about my experience, tips, tricks and general advice that I've found helpful, and hopefully you will to! Kicking off the series is resume tips! Your resume is one of the most essential parts of applying for an internship. This is where your potential boss will see if you are even a good fit for the job and if you are qualified enough. 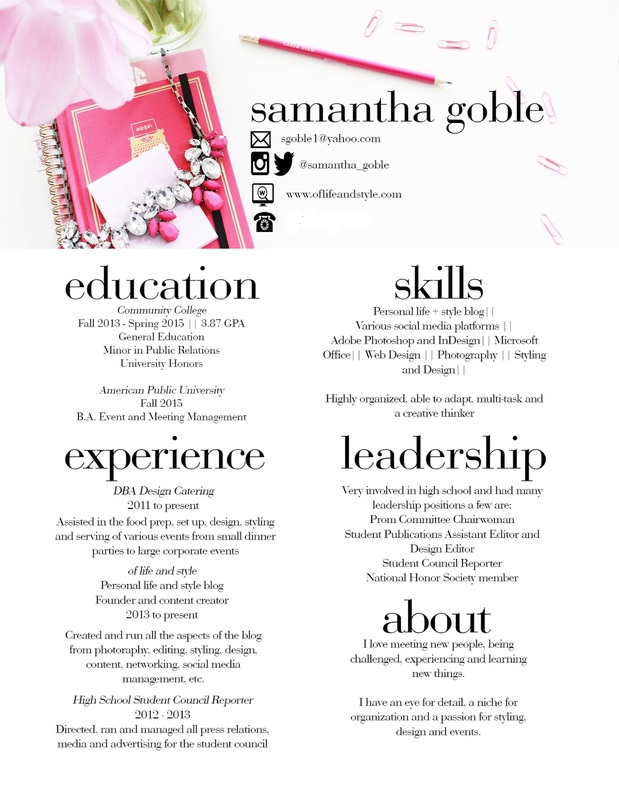 To be honest I didn't have a 'grown up' resume and now had to create one. I took to Pinterest, Levo League and The Prepary for tips and tricks on crafting the 'perfect' one. After reading article, after article, after article I knew what I wanted to include and what I didn't. By no means am I an expert. I'm simply sharing what tips I have to help you with yours. So what are my resume tips? Glad you asked! Tip No. 1: Make it reflect your personality// Your resume is a reflection of you. It is the first impression your potential boss will see when he or she is flipping through 101 applications and other resumes. Be creative and make it stand out. But don't go overboard. Tip No. 2: Be concise, Don't Ramble// Don't write out your entire work history or life story. Your potential boss is not going to read all of it. He or she will most likely skim over it and see if just at a glance you are worth calling in for an interview. Keep it short, sweet and to the point. Tip No. 3: List only relevant experiences// Going hand in hand with being concise is listing only relevant experiences for the job. Don't mention that one summer job you had years ago mowing lawns if you are working at a tech company. Employer's are looking for what current experience you have. I had trouble in this department because I didn't have any 'real experience' in my field. In my case I listed what experience I had in high school because it was relevant and I hadn't been out of high school for too long. But the general rule of thumb is to only list what's relevant. Tip No. 4: Be specific// When listing out your relevant experiences, skills, accomplishments, etc., be specific. Employer's like to know what exactly it is you did. They like details. Don't generalize or be too vague. But also don't go writing a novel. See Tip No. 2 for length. Tip No. 5: Spelling and Grammar matter// Spelling and grammar are extremely important when it comes to your resume. Don't use abbreviations or 'text lingo'. Spell everything out. As for grammar, use proper punctuation and try to stick to one verb tense. Triple check everything before you save and send it off. Tip No. 6: Don't ignore formatting and aesthetic// Keep all your formatting the same. If you use Arial for your font don't just randomly decide to use Times New Roman. Try to stick with no more than 2 fonts. Anymore and it will get cluttered and distracting. Use the bold or italicized fonts to help differentiate your wording. Stick to 4-5 headings on your resume. Remember, only include what's relevant. Make sure your resume is clean, neat and organized. No employer wants to read a resume that's all over the place. When creating it, organize your topics by what makes sense logically. Tip No. 6: Save it as a PDF// Saving your resume in a Word document is a big no-no. Save it as a PDF. There are tons of free Word to PDF converter sites out there that can do it for you. By saving it as a PDF it makes it cleaner, easier to read and more professional. Tip No. 7: Share your links// Include your social media links. Employer's like to know who it is they're interviewing. Just make sure that what you have on your social media sites is work appropriate. Those are all my resume tips! 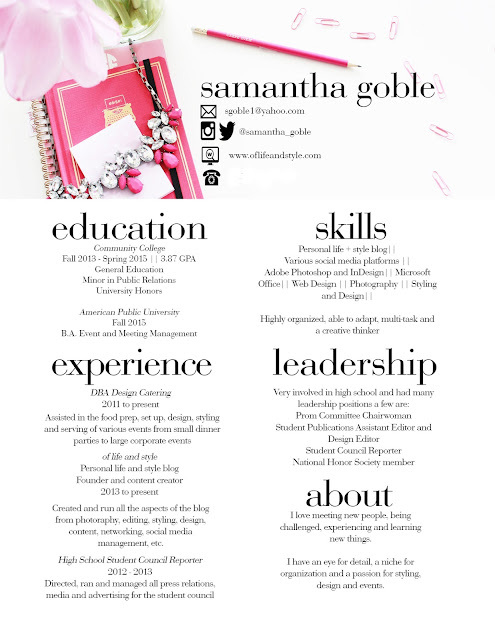 And so you can see them in action here is my current resume! So there it is! Turned out pretty well if I do say so myself! Do you have any resume tips? Leave a comment sharing! "this is not just a resume, but the evolution of passion throughout the years of diligent work on the way to becoming an expert"
Awh thank you very much! I appreciate that! :) I definitely tried to keep it professional but still fun! Hope my tips helped! You game resume tips. I told that, This tips is must be informative and helpful. Thanks for this great post. I am want to more more about full service digital marketing agency. Great post! Thank you for sharing valuable information. Keep up the good..
As more and more companies are beginning to use modern technology to find new employees quickly and efficiently, you are going to have to find new methods to draw attention to your application with the help of online resume editing. The best way to do this is to be precise and direct in your approach. Vert important information you write in here to make better resume in here and i know this will be best for every educators. I also like this. click to explore that will help you more to know about the academic papers writing. In this form of the The Intern diaries you can get the best tips for the best resume. You have to list only relevant experience and be specific. With this site you can get the door to the success in the easy way. Rather than expanding your typing speed as a definitive objective, (which isn't excessively critical in coding), attempt to make your objective to have the capacity to type WITHOUT taking your eyes off the screen and taking a gander at the keyword. – Once you ace this, the expansion in speed will fall into place. In this blog we will get tips for resume making. So job seekers should come to this blog. They will not get the great profile information but they will get the knowledge of the best tips for making there CV to get a best job.